Team, I’m bringing you my guide to festival etiquette today. And it’s very easy. There’s hardly anything to remember. Quite simply: do not go to any festivals. Not one. Not even if your own mother will be up there on the Pyramid Stage at Glastonbury, shaking a pair of maracas. Just don’t. I have reached this conclusion after several summers of festival going. It started when I was 13 and I went to T in the Park in Scotland, a festival held, back then, just outside Glasgow. It is called T in the Park not because they serve a lot of tea, but because it’s sponsored Tennents, the Scottish lager. I was with two school friends and the freedom was intoxicating. We shared a 10-pack of Marlboro cigarettes and felt like characters from Trainspotting; we rammed ourselves into a small tent where a new band called Coldplay was singing a song called Yellow; we pretended to each other that our plastic cups of warm lager were delicious. Unfortunately, being Scotland, it was wetter than a rainforest and my friend Alex got trench foot. Or something like it. Upon returning to her house Edinburgh on Sunday, Alex’s mother ran a warm foot bath and spent several hours gently trying to remove clods of mud from Alex’s creviced feet while I lay underneath 43 duvets in an attempt to stave off pneumonia. A couple of summers later, it was off to V Festival in Staffordshire with another bunch of school friends. We screamed with delight at Travis and Macy Gray before agreeing that it would be a jolly idea to all go and get new piercings. I decided what I’d always wanted was a nose piercing (God knows why, my nose has its own eco-system and needs no attention drawn to it), so a man in a caravan held a piercing gun against my left nostril and pulled the trigger. Well, the piercing gun got stuck. And my friend Emma, who was holding my hand for moral support, fainted while the man tried to waggle the gun free. It was deeply uncomfortable. We all needed a sugary can of coke afterwards but could only find Virgin Cola. So that, too, was a fairly traumatic experience. Then, a few years back, I went to Secret Garden Party in Cambridgeshire. It was a clement July day and the rain beat down on us as we drove our teepee pegs into the ground. And then we went off to get a drink. Then another drink. Then a few more drinks. And I am afraid to say I overdid it so badly that I was forced to return to the sagging teepee long before midnight to go to bed (I say bed, but what I mean is a damp sleeping bag on a saturated ground sheet). And I had to stay in ‘bed’ for the entirety of the following day, only to emerge briefly for an hour or so for the firework display that night, before returning to my sleeping bag. 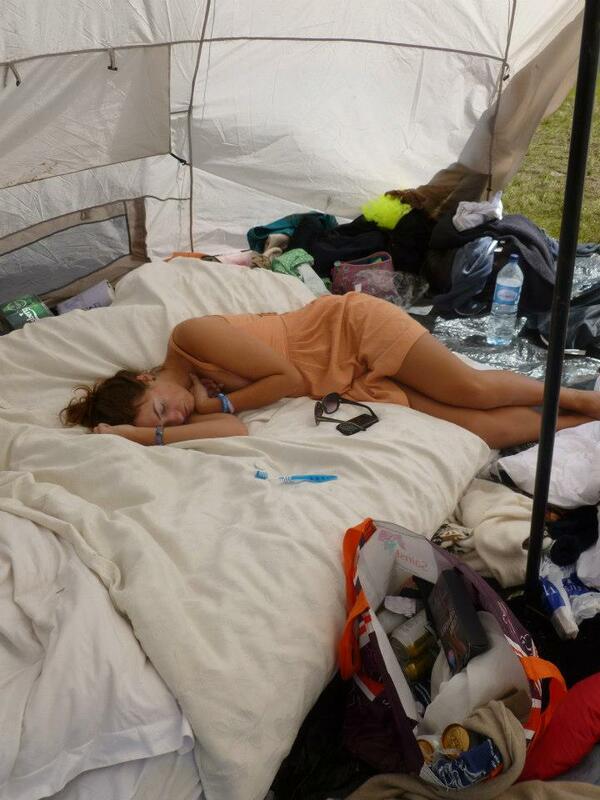 I basically dozed through the entire festival. There are photos of me in this teepee looking so pale and wan I could be the tragic heroine from a Victorian novel who’s about to kick it. I haven’t been to a festival since, although I still bear the scars. Both mental and physical. If you inspect my nose, you will observe what looks like a giant blackhead on the left side but is in fact a hole which has never closed. A little souvenir from the piercing. So, there you have it. Don’t go to a festival this summer. Stay at home and listen on the radio or watch the proceedings on telly. The marvellous thing is you don’t have to queue for your own fridge and your bed is, I hope, warm and dry and much more comfortable than sleeping in a giant polyester condom. The word ‘glamping’ is on the banned list too, fyi.